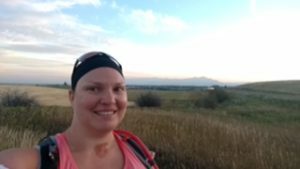 I grew up in a small town in Montana but was not a runner when I was living there. So when I saw that Bozeman would be hosting a race the same weekend that I planned to be in the area visiting my dad, I really wanted to sign up. But then the summer heat and a busy work schedule completely derailed my training and I wasn’t sure if doing a half after not running more than 4 miles since June was the best idea. So I made a deal with myself: if I could make it through Baltimore’s Charles Street 12 race (which I was already signed up for and took place the week before the Bozeman race) then I would go ahead and sign up for the Bozeman Half. The two races had similar profiles according to what I saw online, but the temperature in Bozeman would likely be cooler and less humid so I thought if I could finish Charles Street then I should be able to do Bozeman without killing the rest of my vacation. I’ve never run a race in Montana, but I got the impression that the Bozeman event is one of the smaller long-distance events. 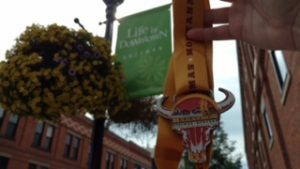 The weekend included four main races: the full marathon (the official name of the event is the Bozeman Marathon, after all), a four-person marathon relay, the half marathon, and a 5k that took place the day before the longer races. 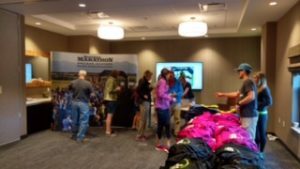 Packet pickup took place in one of the conference rooms at a hotel around the corner from Bozeman Running Company, the store hosting the event. 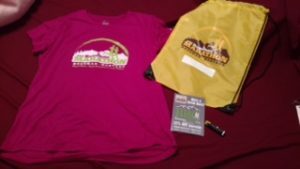 Men and women had different color shirts (magenta for women and black for men, I think), and the goody bags were different colors for the marathon and half marathon ((blue for full and yellow for half). The rest of the swag consisted of some chapstick and a coupon from the running store. So not a lot of stuff, but more than a Disney race and on par with races like the Jeff Galloway 13.1. Because I’d be running this race in the middle of a 3-week road trip I had to streamline my gear. There would be no elaborate costume for this race. Instead I picked a denim-print skirt since that was the most cowboy-like thing I had. But what I should have done was pick a blue and gold color scheme to support the local Montana State University Bobcats! The gear: Black Bondi Band headband, orange Nike tank top, orange Adidas sports bra, denim-print SparkleSkirt with built-in shorts, cheap white arm sleeves (just until the race started), Injinji socks, New Balance 860v6 shoes with custom orthotics (because my poor feet don’t agree with running anymore), Garmin Forerunner 620 and Gymboss timer, and UltrAspire Astral hydration vest. 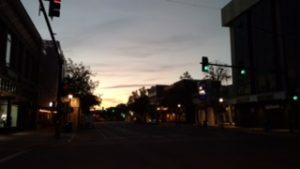 Both the half and the full started outside of town and ended on Main Street. Runners were encouraged to park near the finish line and take the busses to the respective starting lines. The marathon busses left at 5:45 AM for a 7:00 start, and the half marathon busses left an hour later for a 8:00 start. I parked at 6:00 in a garage a block away from Main Street (parking was free on Sunday morning!) and walked over to the hotel where packet pickup had been to use the bathroom. There were a few other runners hanging out in the hotel lobby and even though we weren’t hotel guests they were fine with us making ourselves comfortable. I had expected to be the only East Coast person at the race. But the first girl I saw when I came out of the bathroom was wearing a Maryland race shirt—she was from Ellicott City. And the guy we ended up chatting with in the lobby was from Virginia. Neither person had any ties to the area so I gave them some tips of things to check out while in town while we waited for the bus. At about 6:30 we left the hotel and walked two blocks to the busses. We got on the first group of busses (classic yellow school busses) to go out to the starting line. For those readers familiar with the area, the half started on Cottonwood Road. For those readers not familiar with the area, the race started several miles outside of town in the middle of open fields. I arrived on one of the first two busses and immediately used a porta-potty. I was the very first person to use it that day and it was so nice and clean! I had no idea how many people would be running the half, so when I first got there it seemed like they had more than enough. But as more busses arrived the line really grew. So either there weren’t enough potties or people were camping out in them. I had to wait about 45 minutes from the time I arrived until the race started. I climbed a dune and watched the sunrise. I chatted with a gentleman who used to live in Atlanta and trained with Jeff Galloway 20 years ago for his first marathon. Eventually I wandered over to the starting line to stretch. The temperature was about 50 degrees so it was a little cool standing around in the shade, but I knew I would heat up as soon as I started running. The start of the race was very low-key. They had some music playing, they counted down to the start, and then they rang a bell and sent us on our way. I was surprised they didn’t play the National Anthem, especially since we were running on the 15th anniversary of 9/11. The half marathon runners started at the halfway point of the marathon course. The profile suggested that the first three miles of the half would be generally flat and the remainder should be downhill all the way to the end. Overall I think this was accurate, but there definitely were some gentle uphill portions throughout. My race plan was to run the first 7-8 miles and then probably walk the rest. Due to the elevation I tired a lot faster than expected and actually only ran the first 5-6 miles before I started walking. But I was kept company almost the whole way by Suzie, a retired lady who was visiting her daughter in the area. She was recovering from hip surgery and this was her first race post-surgery. As we passed through fields and neighborhoods it was nice to have someone to chat with. Plus, I paced her to finish 30 minutes faster than she’d expected. If you are the type of runner who needs a lot of entertainment or crowd support, this is not the race for you. 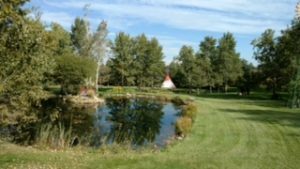 If, however, you run to be close to nature, then this is a great course. 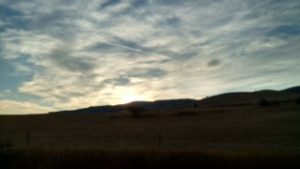 We started outside of town passing through fields near ponds and streams and in the shadow of the mountains. We eventually entered though some residential areas where a few locals came down to the end of their driveways to cheer for us. Unexpected Magic. My favorite was the little girl who had a table with strips of bacon and cups of Coke and sang for the runners as we passed…so cute! We eventually came around the Museum of the Rockies and the MSU campus before dropping on to Wilson Boulevard. Wilson connected to Main Street and the finish line. And with that, we were done! I found the course support to be pretty good. Water stations (many with port-a-potties) were every 1.5-2 miles. While they were small, they were plentiful. But runners should know that the course was not closed to traffic until we got onto Wilson. Until that point, runners were on one lane and cars were allowed to pass on the other lane. There really isn’t a lot of traffic in Bozeman on Sunday mornings but if traffic is a concern for you, now you are warned. One last thing to note: this course is certified to qualify for Boston. The beginning of the marathon course has some notable uphill sections, but you would make up that time with the downhill portions at the end. I really thought this SMO was fun and unique! It’s in the shape of a buffalo skull with the event logo stamped on it. I believe the medals for the half and the full were the same, with different ribbons for each distance. It’s definitely one of the more unique shapes in my collection and it’s a great souvenir from my road trip! 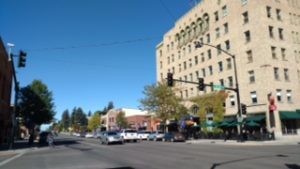 I had considered stopping in one of the restaurants on Main Street for lunch before heading home from the race, but I was tired and had things to take care of before packing the car to leave my dad’s house the next day. Instead, I grabbed a water and banana from the post-race refreshments, checked out the live band for a minute, then headed back to the car. I briefly stopped at a gas station to grab my customary chocolate milk and headed back over the mountain to my dad’s house. Although I did have my normal playlist on shuffle, I didn’t pay much attention to it since I was chatting with Suzie most of the time. There were two notable musical events: as I crossed the starting line “Wide Open Spaces” by the Dixie Chicks came on and as I approached the finish line “Stronger” by Kelly Clarkson played. Both were perfect for the moment. Although my running performance left a lot to be desired I am happy I ran this race. Because I waited until the week before to sign up I paid significantly more than if I’d registered when I first found the race. But I still felt it was a good value compared to the Baltimore and DC races I usually run. 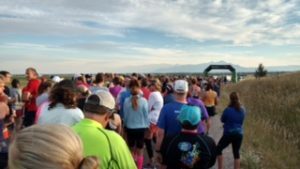 Mid-September weather in Montana can be hit-or-miss: on race day the weather was perfect with no humidity, but by the following night the temperature dropped below freezing and snow was a possibility. If you’re looking for a race to check off for your 50 states challenge, I would recommend this one.